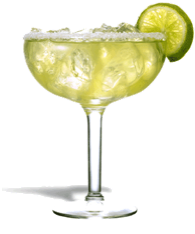 The margarita is a Mexican cocktail consisting of tequila mixed with Cointreau or similar orange-flavoured liqueur and lime or lemon juice, often served with salt on the glass rim. It is the most common tequila-based cocktail in the United States. The drink is served shaken with ice (on the rocks), blended with ice (frozen margarita), or without ice (straight up). There is no solid proof who "invented" the Margarita. The most accepted of all stories is that the Margarita was invented in October 1941, at Hussong's Cantina in Ensenada, Mexico, by bartender Don Carlos Orozco. One slow afternoon, Don Carlos was experimenting with mixing new drinks when a prestigious visitor arrived: Margarita Henkel, the daughter of a German ambassador, who lived with her husband Roy Parodi near the city in Rancho Hamilton. Don Carlos offered the drink to Margarita, and named it after her for being the first person to taste it. He concocted a mixture of equal parts tequila, orange liqueur, and lime, served over ice in a salt-rimmed glass. However, Don Carlos' recipe was made with Damiana Liqueur, not Cointreau orange liqueur. He may have named his drink after Margarita Henkle, but it is not the drink the world enjoys today. Another common story related the Margarita being invented a few years earlier at the Rancho La Gloria Hotel, halfway between Tijuana and Rosarito, Mexico, by Carlos "Danny" Herrera, for a former Ziegfeld dancer named Marjorie King. This story was related by Herrera and also by bartender Albert Hernandez, who is acknowledged for popularizing the Margarita in San Diego after 1947, at the La Plaza restaurant in La Jolla. Hernandez claimed the owner of La Plaza, Morris Locke, knew Herrera and visited Mexico often. Another explanation, however, is that the Margarita is merely a popular American drink, the Daisy, remade with tequila instead of brandy, which became popular during Prohibition as people drifted over the border for alcohol. There is an account from 1936 of Iowa newspaper editor James Graham finding such a cocktail in Tijuana, years before any of the other Margarita "creation myths". Margarita is Spanish for Daisy, which is an Irish nickname for Margaret. It is likely that Orozco, Herrara, and Cruz merely perfected the "Tequila Daisy". The Aztec people were first to make a fermented beverage from the agave plant long before the Spanish arrived. However, the Spanish had been introduced to the art of distillation by the Moors in 800 A.D. and they brought the technology with them when Cortez landed in 1519. When their brandy ran out they began to distill the Aztec beverage to create North America's first indigenous distilled spirit. First produced near the future city of Tequila, this would eventually become it's name. Around 1600, Don Pedro Sanchez de Tagle began mass-producing at the first factory in the territory of modern-day Jalisco. In actual fact, all tequilas are Mezcal but by Mexican law only those made from Blue Weber Agave can be called "Tequila." There are however over 130 species of Agavaceae in Mexico and several can be used to make Mezcal using natural processes over four hundred years old. Our Friday night tasting includes an exotic tour of pure Meacals, Sotol, Bacanora and Raicillia from the region.